"Salivary cancers are almost invariably malignant tumors." Salivary cancers are almost invariably malignant tumors originating from the secretory cells of the glands. Other swellings or tumors of salivary glands may be due to infections and cysts. The glands may also become swollen because of infiltrates from other cancers including those of fat, lymphoid, mast and melanocyte cells. The classification of human salivary cancers is complex as treatment of these cancers in people is different for different types and different stages. In animals, fewer types have been recognized although adenocarcinomas, mucoepidermoid tumors originating from the gland ducts and mixed tumors are recognized. The tumors are locally invasive and spread (metastasize) to the adjacent lymph nodes (glands) as well to more distant parts of the body such as the lungs. Cancer is non-lethal genetic damage of cells (mutations in the genome). Causes include radiation, chemicals, hormones and infections. The mutated cells upset the normal regulation of cell death and replacement. They do this by activating growth-promoting oncogenes (cancer genes), inactivating suppressor genes and altering the genes that regulate normal, programmed cell death (apoptosis). Why has my pet developed this cancer? Some animals have a greater tendency (genetic susceptibility) to cancer. Some breeds have far more cancers than others, often of specific types. The more divisions a cell undergoes, the more probable is a mutation so cancer is more common in older animals. "Tumors arising from the salivary glands are uncommon, although slightly more common in cats than in dogs." 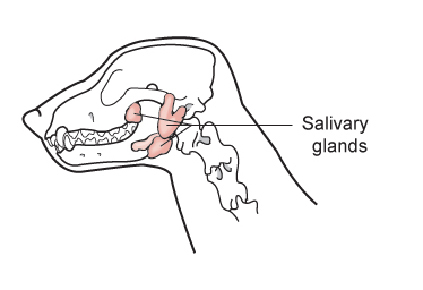 Tumors arising from the salivary glands are uncommon, although slightly more common in cats than in dogs. They are most frequent in older animals. How will this cancer affect my pet? These tumors usually cause a painful, one-sided swelling of the face or neck. Most salivary tumors are firmly attached to the adjacent tissues. Other clinical signs, sometimes noted before the swelling becomes obvious, include drooling saliva and difficulty in eating. How is this cancer diagnosed? Clinically, your veterinarian may suspect this tumor based on location and symptoms. X-rays may be useful in detecting whether tumors have invaded the bones and to guide surgery. Definitive diagnosis of tumor type relies upon microscopic examination of tissue. 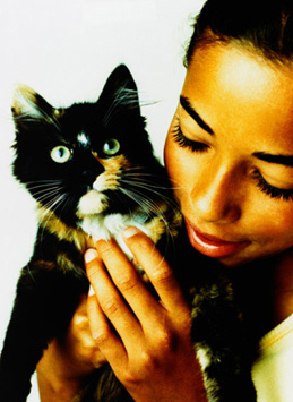 To obtain the appropriate samples, your veterinarian may recommend one or more of various sampling techniques such as fine needle aspiration, punch biopsy and full excision. The sample will be prepared and examined by either cytology or histopathology. Cytology is the microscopic examination of cell samples and it may indicate cancerous cells. This is useful for rapid or preliminary screening tests. Histopathology is the microscopic examination of tissue samples that have been specially prepared and stained. Histopathology will give a more accurate diagnosis and prognosis (prediction of behavior. Histopathology also rules out other forms of cancer. Your veterinarian will submit the samples to a specialized laboratory for examination and diagnosis by a veterinary pathologist. Although the submitted piece of tissue may be a small part of the mass (biopsy) or the whole lump, only by examining the entire lump will the pathologist be able to indicate whether the cancer has been fully removed. Treatment is surgical removal of the lump and possibly the draining lymph nodes. Can this cancer disappear without treatment? will still need surgical removal. The body's immune system is not effective in causing these tumors to regress. After surgery, your pet may need to wear an "Elizabethan collar" to prevent any interference with the surgical site. If the surgical wound is in the mouth, your veterinarian may request that you do not try to examine the surgery site in the early post-operative period. However, if your pet is unable to eat or develops significant swelling or bleeding, you need to contact your veterinarian immediately. If the surgical site is visible, loss of stitches should also be reported. Your veterinarian will tell you if your pet also requires a special diet or medication. If you require additional advice on post-surgical care, please ask. How will I know how this cancer will behave? "The histopathology report will give your veterinarian the diagnosis that helps to indicate how it is likely to behave." The histopathology report will give your veterinarian the diagnosis that helps to indicate how it is likely to behave. The veterinary pathologist usually adds a prognosis that describes the probability of local recurrence or metastasis (distant spread), and if the entire lump was submitted for examination, will usually assess the completeness of excision. When will I know if the cancer is permanently cured? 'Cured' has to be a guarded term in dealing with any cancer. Benign tumors (adenomas) of salivary gland are too rare to predict behavior. The potential for malignant transformation is uncertain. Malignant tumors invariably spread locally and to the lymph nodes. Some also spread to distant organs such as the lungs. Survival time tends to be short because of the painful nature of the tumors. No, these are not infectious tumors and are not transmitted from pet to pet or from pets to people.